Identification: Forewing is relatively short and blunt. 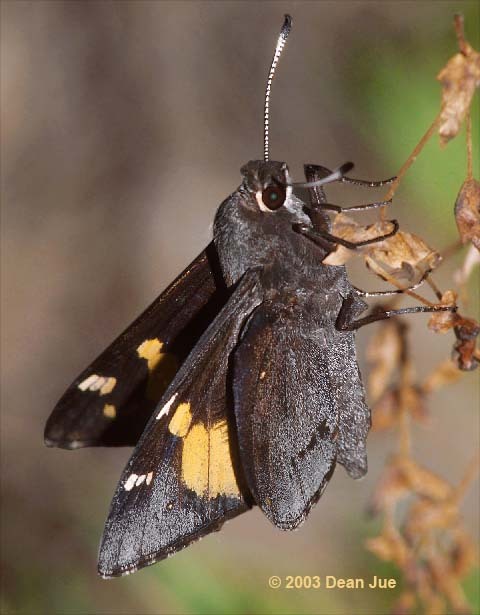 Upperside is black; forewing has a broad yellow band that arches inward to the middle of the costa; hindwing has long hairlike scales at the base. Underside of hindwing is gray with small white spots. Wing Span: 1 15/16 - 2 7/16 inches (5 - 6.3 cm). Life History: Adults have a swift and strong flight, and rest on the shady side of tree trunks about 3-6 feet above ground. Males probably perch in the morning to wait for receptive females. Females glue eggs singly on leaves of the host plant. The young caterpillar bores into the stem and root and spins a silken tunnel where it feeds and overwinters. A fully-grown caterpillar makes a silken tent which projects from the stalk of the host or from the ground near its base. The tent becomes camouflaged as bits of soil and leaves stick to it, and within, the caterpillar pupates. The chrysalid can move up and down in its burrow. Flight: One brood in Georgia from July-September; two broods in Florida from March-November. Caterpillar Hosts: Bear grass (Yucca filamentosa), Spanish bayonet (Y. aloifolia), and Small's yucca (Y. smalliana). Habitat: Coastal dunes, pinewoods, shrubland. Range: Two isolated populations panhandle, and peninsular Florida.